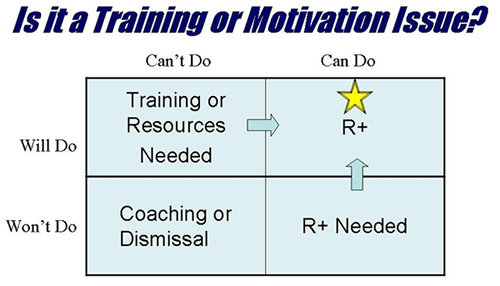 This 4 x 4 matrix represents the combination of the training and motivational elements in place in a safety environment. They are used to help determine the best strategic approach to address behavior modification/performance. In the Will Do but Can't Do situation, you have WILLING employee(s) who want to PERFORM, but they just CAN'T because they either don't know how or don't have the right resources. Organizations (or employees) in this quadrant usually indicates a good culture and work attitude, but success components are missing. In this case, the approach is to provide TRAINING and/or RESOURCES before you motivate. If you try to motivate this group before you make them capable, they will become frustrated. You in essence will create "energized incompetence". For example, if you want them to use safety belts to latch on over six feet and you don't provide the safety belts, they can't comply. If you want them to follow a procedure for lockout and they haven't been taught the procedure, then they can't comply. Once you provide the training and resources this group will naturally perform as desired. Then by adding positive reinforcement (R+) with incentives, they will respond very favorably and it will help to reinforce the company's commitment to these behaviors. In the Will Do and Can Do situation, you have an ideal environment. The culture dictates the standard for high performance from both the company and the employees. The company provides training, they provide the required resources, and they provide supportive management and approach safety as a priority. The employees embrace their role in safety and follow polices and procedures. R+ in this quadrant is designed less as an incentive and more in the form of recognition. It keeps the atmosphere fun and provides a continual focus on the importance of safety. In the Won't Do and Can't Do situation, you have employees or groups who are not adequately trained or don't have the resources to perform and even if they did, they may push back on performing. This quadrant requires much more than incentives (although incentives and recognition play a critical role in prompting behavior and support coaching efforts). This is a culture issue which the structure is supported by management who only uses safety as a smoke screen and employees who spread discontent and stubbornness. Often it is hard to spot this as a culture and easier to find in particular individuals. None-the-less, the use of incentives in this group are much more focused on specific events intended to shape their performance as opposed to general or broad based program goals. Behavior based goals versus result goals are essential to support coaching. (Termination for some employees is also a tactical necessity in some cases). It may be surprising, but the Won't Do but Can Do group is extremely responsive to incentives and recognition. This group usually indicates people who have the skills and resources, and the management team which support safety, but there are competing contingencies. In other words, production is more important in their view and they take short cuts to get the production goals met. Also, this group may know the correct or best way to be safe, but they have old habits ("I have always done it this way and I haven't had an accident yet!"). Training in this group is often ineffective and a waste of time (because they already know how to perform, they (for whatever reason) are choosing not to). When incentives are used with this group, they are very effective. The goal is to get people first to try doing it the right way and then get them comfortable in doing it that way. Ultimately they build the habit and it becomes the common way and natural way to perform. As you can imagine, the organization may view these people as stubborn, but often they just need a prompt (R+) to get started and then some good ole social R+ to keep the habit forming.